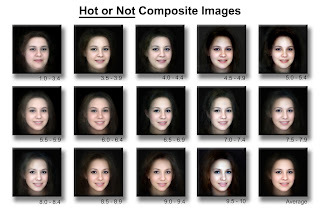 Pierre Tourigny over at flickr has posted facial composites of hot or not women based on their user ratings. Fatness-thinness seems to be the most salient feature of the attractiveness continuum, probably accounting for the really low ratings. For women that don't receive really low scores, no obvious pattern is apparent, although the top girl seems to have fairly large eyes and a narrow chin.. There are also composites of Miss Universe contestants by continent of origin and hot or not women based on age. Their creator uses the same program, Szirlz Morph that I have used to create these composites recently. Hmmm... really on first sight, it is as you say: For women that don't receive really low scores, no obvious pattern is apparent, although the top girl seems to have fairly large eyes and a narrow chin..
1. There appears to be some pattern (even excluding the fat women with lowest scores) to prefer narrower faces. It's not perfectly constant but there it is, I think. 2. The higher scoring faces appear to have more arched eyebrows with some greater separation from the orbits at the outer sides. 3. The "hottest" composite appears to be somewhat in a "challenging" or rather "visually asking" attitude towards the viewer. This may also be the case of the second and maybe even thrid "hottest" images but less explicitly so. 4. The wider eyes appearence may not be restricted to the "hottest" scoring composite but in that case it is enhanced by more makeup around the eyes. The widening of the eyes may be anyhow a pose rather than a biological feature. The girls do seem to look differently expressing different info about themselves and their interest in the camera (that's you: the viewer). So I percieve two morpholoical features (face breadth and eyebrow shape) and two attitude (psychological) factors. "For women that don't receive really low scores, no obvious pattern is apparent"
Composites will average out asymmetry.